This archetype mutates the tinker into Ironman! This pdf clocks in at 6 pages, 1 page front cover, 1 page SRD, leaving us with 4 pages of content, so let’s take a look! The Ironclad archetype gets 3/4 BAB-progression, invention levels that scale up to 6th and a dual blueprint budget, with primary and secondary blueprints being tracked separately, the former beginning with 1 point and scaling up to 20 budget, the latter beginning with 1 point that scales up to 5, 2 known scaling up to 8. Primary? Yes, this would be a blueprint with a schematic that contains class level (if you haven’t gleaned that from the above) BP. Secondary blueprints are limited in that the number of inventions it can contain is equal to or less than 2, with said limit increasing by +1 at 3rd levels and every 3 levels thereafter. Not that hard, right? 1st level also sees the Suit up ability – essentially, this is the Ironman-archetype for the tinker – suiting up and exiting the suit are full-round actions that provoke AoOs, though only the ironclad can suit up and reentering a suit is not possible. Suiting up nets you 2 x class level temporary hit points. The suit can have any combination of primary and secondary blueprints, which means that the primary blueprints provide the basic array for the suit, with the secondary ones providing modification-suites. An ironclad may suit up once at 1st level +1/day at 2nd level +1/day every 3 levels thereafter. Since the suit is physical only, skill rank-granting or class skill-granting inventions have no effect. Non-design-inventions that grant untyped bonuses instead grant enhancement bonuses, making synergy with magic items work properly and prevent abuse. Inventions that repair damage instead grant half the benefit as temporary hit points to the ironclad’s hit points. Cockpits and its follow-ups don’t work, but saddle can be applied to an Ironclad’s suit, allowing other creatures to hitch a ride. Inventions that net proficiencies do not provide weapons – unlike automata, though, the suit allows for the wearing of magical items, though not ones that require line of sight to the target of the magic item to work: Obviously, a ring can’t emit a blast of fire, when a sheet of metal is in the way. Conversely, no delicate manipulations can be made to activate the like. If an ironclad has a feat an invention grants, then the ironclad may prepare suit blueprints as though that invention were already present, thus allowing you to save on BP-cost, with similarly a suit granting such a feat can be considered sufficient for the purposes of feats and similar prereqs, though sans the suit, the ironclad obviously can’t utilize a feat based on one the suit grants. Conversely, such a ruling applies to equipment and physiology. Obviously, an ironlcad does not need to give directives to his suit, instead counting as though the invention use were an alpha, with the exception of counting as a tinker for purposes of reloading inventions with compartments. Additional deploy automata-grants instead apply to additional suit-uses. The ironclade pay for this with his regular automata, but not with his alpha. Innovations and their greater ilk do not modify standard automata or blueprints and instead modify the ironclad while within the suit or the suit blueprints, respectively – but since he needs no directives, an ironclad obviously cannot learn more of them and he obviously cannot learn to deploy new kinds of automata or directives. HD of the suit are not modified by choosing innovations that modify the HD of regular automata, instead gaining twice that many temporary hit points. *takes a deep breath* So that would be the primary set-up of this archetype; now if you end up slightly confused by the set-up provided here and its interaction with primary/secondary blueprints, you should take a look at the array of new innovations provided – here, we have interactions with the secondary blueprints influencing the capabilities of the ironclad – for example in the guise of extra ammunition. beyond those, boosted reflexes, more HP etc. make sense. On a nitpicky side, the innovation that nets DR 3/- should specify that the DR is only granted when receiving temporary hit points from the suit, not “Whenever you have temporary hit points.” The innovations allow for a painful overheating (akin to kamikaze with no save for the ironclad, but no instant-death) and also alternate acid blasts – and you may activate an ejector seat at higher levels. Alas, I’m not sure how much damage a hurled ironclad deals to targets subjected to such an ejected ironclad. At higher levels, ironclad can include inventions with the Alpha-descriptor in this suit and the greater innovations allow for a means to burn suit uses to refresh suit HP to prevent having to execute suit-changes mid-battle. Retrieval of items when inside the suit, weapon mount attacks as off-hand additions to full attacks with ranged weapons can also be executed – interesting, though quite situational, would be the option o send ray that exactly hit your armor back at the original source of the ray. Editing and formatting are very good, though not as tight as in most Interjection Games-releases – beyond the above, I noticed a bolding glitch, for example. Layout adheres to IG’s crisp two-column b/w-standard and the pdf has no bookmarks, but does not require them at this length. The pdf does not sport artworks. Bradley Crouch’s Tinker Expansions are a ridiculous amount of work for such short pdfs. No, seriously – it takes me longer to review these cool, complex expansions than to analyze pdfs with 10 times the pages. The concepts are complex, the options unique and awesome – and this is no different. Now, I do think the ironclad can benefit from some streamlining – while the exceedingly complex suit works well in practice and actually manages to completely rewire the tinker’s rules-corset (in an exceedingly impressive feat, design-wise!) to work in a completely different way, the presentation could be slightly more concise: beyond the aforementioned hiccups, I think the primary/secondary blueprints and the cap for the suit could have benefited from a more explicit explanation. Playtest also did show that the HP-increase of the suit could have used some extended defensive capacity to make up for the action economy loss due to no regular automatons and, more importantly, the more focused heat the tinker thus necessarily receives. The HP-increasing should be available for multiple, increasing iterations, be stacking or have some upgrades – remember, the suit is essentially like an automaton and as such, pretty fragile. That being said, this has, at least as far as my tests went, provided a huge bunch of interesting options and the customization of suits is glorious, especially with the massive expansions out there. This is probably as close to being a full-blown, playable ironman you’ll get with PFRPG. In the end, my final verdict will clock in at a solid 4 stars – a good, interesting and versatile archetype with some minor rough edges that do not significantly detract from the awesomeness of the concept. You can get Ironman – the Archetype here on OBS and here on d20pfsrd.com’s shop! Thanks for the review, Thilo! I won’t be updating this one at this time. The inventions bit could withstand a little elaboration when this goes into Ultimate Tinkering. As it is now, it gets the point across well enough and I’m being all lazy in the face of adding a page to the layout when I’m currently staring at three triple-digit page count projects in varying states of completion. I am still of two minds regarding that one. Finally, yeah, the power level is a little lower. Effectively, the secondary blueprint gives the ironclad a wearable megadroid that he walks around in, so I’d put the raw potential of an ironclad versus a tinker (barring combat maneuver spamming and other cheesy tactics) at roughly equal until level 13 or so. At that point, the ironclad clearly falls behind and has to resort to being cheesy with the confluence of factors that is a 13th-level player character wearing a buff suit over a full array of gear. This is my “synthesist”, sir, and I intentionally aimed low on the power scale to have something fun and weird that transformed the tinker into something else without making it a *censored* SYNTHESIST. That said, I’m pretty sure your players can find a way to mix what exists to make something fairly broken in very limited situations. 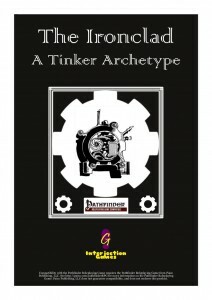 The problem here is not one of absolute power – I make something borderline broken when testing this myself (go for the innovator) – but rather that, and I hate to say this, the tinker doesn’t embody the proper options to really put this archetype on the map. It’s a rough edge that needs a few pages of inventions added to the back of the book specifically to interact well with it. Of course, they need to be made options for all the other tinker styles, too, because maybe somebody wants to give his robots lightsabers or whatnot. So, yes, I’m on board with your perceived lack of power here, though I’m not just going to add a fudge factor – except for maybe an armor bonus to AC when suited up. Bear with me. I’ma knock your socks off. Thanks for the extensive insight into the design-process and your rules-decisions, Brad! Next week’ll be Motebringer + HLA; And yeah, at this point I’m very excited about Ultimate Tinkering etc. – if anyone can sock my socks off on a regular basis, you’re an excellent candidate, Brad! Cheers! Hey, it may be mostly meaningless, but now that Zeitgiest has fumbled, I’d like to take their seals-in-a-row record with the Ultimate series.